Gov. Andrew Cuomo's much-heralded free college tuition program was signed into law on Wednesday, but it came with a bit of an unexpected hitch for many: Students receiving the assistance must agree to stay in New York for at least four years following graduation. The provision added at the last minute at the insistence of State Senate Republicans requires students to adhere to the stipulation or pay the money back. The program, which begins this fall, offers students who attend a SUNY or CUNY institution an Excelsior Scholarship provided their families earn less than $100,000 per year. As the program is phased in over three years, the income cap will increase to $125,000 per year. 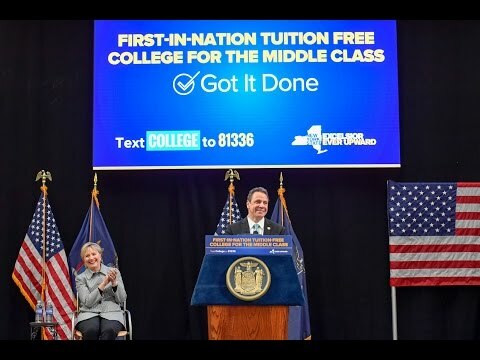 During Wednesday's signing of the bill at LaGuardia Community College, Cuomo was joined by fellow New Castle resident, former Secretary of State, First Lady and New York Sen. Hillary Clinton. "New York State has long been a pioneer in education. Taking this next step to make college tuition-free for hardworking families is the right thing to do, and the smart thing to do," said Clinton. "I was proud to put this plan forward during my campaign, and I'm thrilled that it's become a reality in New York. I hope students, families, and educators across our country will continue to speak out on this issue and call on more states to follow suit." By 2024, 3.5 million jobs in New York State will require an associate’s degree or higher – roughly 420,000 more jobs than in 2014, the governor's office said. Cuomo said the Excelsior Scholarship will equip students with the skills they need to succeed and ensure they are able to secure the high-tech, high-paying jobs of tomorrow.